This time I want to share with you an awesome compilation of great women's sweatpants to wear this year. You are going to see stunning designs worn with smart-casual and formal essentials. Some of you might think sweatpants are meant only for active and athletic outfit combinations. Actually, these gym basics can be worn in public with awesome tops, blazers and cover-ups. The athletic trend is changing into something everyday appropriate. Of course there are still dos and don’ts to wearing them fashionably. I have gathered some of the best street style images, where ladies appear in these sport style bottoms without looking like they are wearing sweatpants. Hope these images will inspire you to wear workout wear to dinners or parties. Believe me, in fashion, anything is possible. I love to see women wearing those sporty bottoms with chic blazers. Try them on with eye-catching white blazer on. 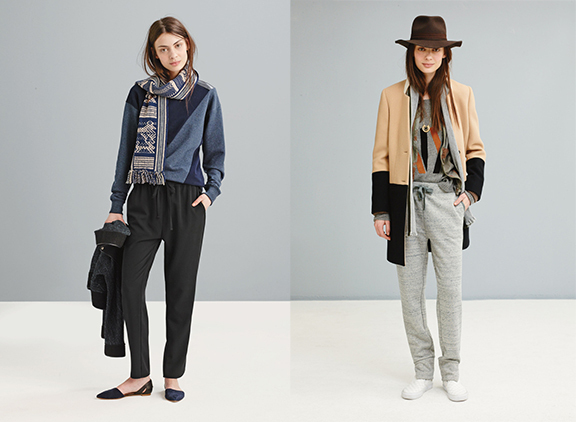 You can wear a formal, office style look, adding your favorite sweatpants on. Just look the way this lady is wearing cropped black version, pretending they are real pants. By adding cool denim on, you can update your urban style. Love the layering of this outfit. If it's quite chilly outside, then you better try on awesome layers. Love these J. Crew looks. If you want something bright and bold, then you better rock a whole printed sweat suit. Think of grunge? Well, you can play with checks. Try on a tartan shirt with your grey basics. Fur looks fancy with your athletic bottoms. Speaking of fabrics, then you can try sweatpants made of leather. Add beautiful heels. I love the relaxed touch if this outfit. Keep it sporty and go for striped pullover and cool sneakers.